Just noticed on facebook , that an avid afl football fan , had designed his own jumper . It was a Collingwood Magpies football jumper , jersey , guernsey, that had his name printed across the bottom , and the number 1 above it . Is he an obsessive footy fan , or just , " a dedicated follower of fashion " ( 60 's Kinks song ) ? Its an interesting exploitation of the magpies brand . Or is it a clever marketing ploy , by Eddie and the gang , to wring even more bucks from the famous name ? 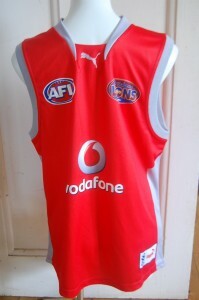 busy delivering personalised , afl football jumpers , jerseys , guernseys , this Christmas ! This entry was posted on Wednesday, December 1st, 2010 at 7:50 am	and is filed under AFL, football jumpers, NRL. You can follow any responses to this entry through the RSS 2.0 feed. Both comments and pings are currently closed.